Boston, Monday, 25 March 1861: Mary Coolidge’s engagement too was discussed [at a meeting of the 1842 Sewing Circle]; of course it is a great thing for her, as the world goes, if she can be happy in it. No one supposes for a minute that her heart’s love is given to Mr. Reed, but she is poor and dependent – he offers her an affluent home and the ability to do much for her mother & Grace. He is a worthy man, whom she can thoroughly esteem, and his kindness and generosity will no doubt eventually win the affection of gratitude at least – and I believe Mary will be a happier woman as his wife than she would be to remain unmarried and so pinchingly poor! There are women who could never do this, who would scrub floors rather than be the purchased wife of any man – who could die of slow starvation rather than marry for a home, an eligible establishment &c – but Mary is not one of these, and I who once would have scorned and condemned such a match, have learned from life’s experience to look more hopefully and charitably upon them – to feel that there are circumstances which may justify such a step – and to believe that it often results in quiet content if not in any higher happiness. Sunday, 8 June 1862: Such a busy week – I have really worked myself almost sick – and how do the girls and women bear it, who keep it up week after week, all the year round? Poor things it is a hard hard life! We have made this week 18 pairs pants, 15 jackets à sacque & two vests – comprising 23 dozen button holes and the sewing on of 25 doz. buttons!! It took Miss Choate, Sophia, & myself with needles and Isabella at the sewing machine – that blessed invention! Sunday, 22 March 1863: Our niece, Isa Gray, develops the noblest characteristics in another sphere of war duties, laboring day after day for the “Sanitary Commission” writing, working, going from town to town speaking to large appointed meetings of women, explaining the modes of aid &c – arousing new interests … in the simple, self forgetful strength of duty, and devotion to a great cause. [This] young girl, but a year or two since, a gay careless school girl, stands a noble woman before us, untiring, undaunted, without a thought of self – putting to shame, in her single hearted earnestness, our tame, feeble, supine lives. I watch her career, which I could never in my best days have emulated, with admiration and respect equaled only by my sincere affection for her. Sunday, 23 April 1865: On Wednes’y last at noon, while the funeral services for President Lincoln were taking place in the White House at Washington, all the churches throughout the land were opened for memorial services – and were thronged by sorrowing crowds. I went after some hesitation to our own “King’s Chapel,” hardly daring to trust myself, for one does not like to betray emotion in public – and I dreaded too … adding to the nervous headache & prostration that struck me down at the awful news [of Lincoln’s assassination]. I was glad I went, however – Mr. Foote’s funeral discourse was admirable, and the whole service comforting & strength giving…. Mary Sanderson Coolidge (1819–1904), who married Benjamin Tyler Reed on 5 June 1861. Mary and Grace Coolidge’s father, Samuel Frederick Coolidge, had died in February 1861. Dr. Gray’s niece, Isa Elizabeth Gray (b. 1841). The Rev. Henry Wilder Foote (1838–1889), rector of King’s Chapel 1861–89. 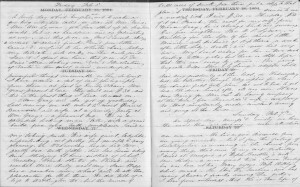 Is this diary being transcribed? Love this diary, and every excerpt is better than the last. Thanks for the effort you’re making to transcribe it, and for letting us go along for the ride. I also enjoyed the article on the Akron couple named Gray (no relation, I’m sure) who are such super Ohio State fans that they named their daughter after the school colors. Lucky for them the colors made a pretty name. Thanks, Doris! I think she is a fascinating writer. It is (and not by me). 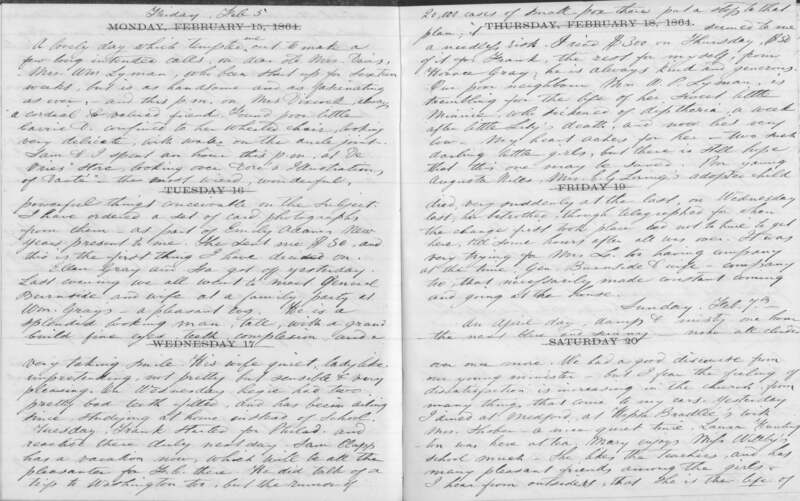 I am reviewing the 1860-65 diary for publication, which includes reading the transcribed diary through 1874 and then looking at PDFs of the scanned diary through 1884. Scott, you have selected some beautifully written, very thoughtful observations from Mrs. Gray’s life. Her views — on women in her world who were being forced by circumstances (poverty and war) to choose paths different from her own — were evolving as she wrote. That’s fascinating! I’m sure many of her diary entries dealt with more trivial matters, but here she is comparing her “tame, feeble, supine” life to that of her hardworking and dedicated niece, and women outside her class who were forced to scrub floors and sew for their living. Observations that might resonate through time, to our world. Thank you for sharing these selections. It has given me great food for thought for my afternoon! Thanks, Candy! Mrs. Gray does cover the mundane (she has a running commentary on her endless sewing for her children), but she often rises (high) above her daily concerns to write about the issues facing a Philadelphian in Boston, with Southern connections and staunchly Republican views, during the period of the Civil War. Rev. Henry Wilder Foote was a Unitarian minister and older brother of noted American composer Arthur William Foote (1853 – 1937). Arthur Foote was a member of the second New England School of composers (along with John Knowles Paine, Horatio Parker, George Chadwick, Edward Alexander MacDowell, and Amy Beach) and was the first to ever earn the degree of Master of Music from an American university (Harvard, 1875).